Emcore stock is trading below $1 and the firm has SEC issues. Will this impact the CPV market? Emcore (NASDAQ: EMKR), a supplier of semiconductors to the CPV market (as well as a builder of optical communication components), received a delisting notice from NASDAQ in August and has until Oct. 18 to submit a plan to regain compliance. Emcore's Solar Power group builds high-efficiency gallium arsenide (GaAs) solar cells, covered interconnect cells, integrated solar panels and concentrating photovoltaic (CPV) systems for utility-scale solar applications. Emcore received a letter from the NASDAQ Stock Market indicating that the firm "was not in compliance with the continued listing requirements under NASDAQ Listing Rule 5250(c)(1)." The NASDAQ letter was issued in accordance with standard NASDAQ procedures, because the firm did not file its quarterly report on Form 10-Q for the quarter ended June 30, 2010 with the SEC according to schedule. According to Emcore, the filing of the quarterly report was delayed because the firm "requires additional time to complete its review of the accounting for certain inventory write-downs and the allowance against a specific account receivable" that Emcore has determined should be recorded. Emcore "intends to file its quarterly report as soon as practicable upon completion of its review." Emcore's stock was down 12.5 percent yesterday on unusually high volume. One of the chicken-and-egg problems that has long plagued CPV is the cost and supply of the triple-junction compound semiconductor solar cell that performs the actual photovoltaic conversion. The low-volume supply chain for these chips has depended on somewhat dysfunctional suppliers Emcore and Spectrolab. Emcore has a history of losing money, questionable management and flirting with entering the CPV system business -- and thus competing with its own customers. Spectrolab makes a quality product, but both of these firms, with a history of supplying the space and satellite market, have found the transition to commercial manufacturing a bit of a cultural stretch. A few VC-funded startups -- Solar Junction, Cyrium and QuantaSol -- are aiming to provide chips to the system vendors. But the market remains relatively low volume and has not taken off like the flat solar panel market with its increasingly massive volumes and plunging prices. 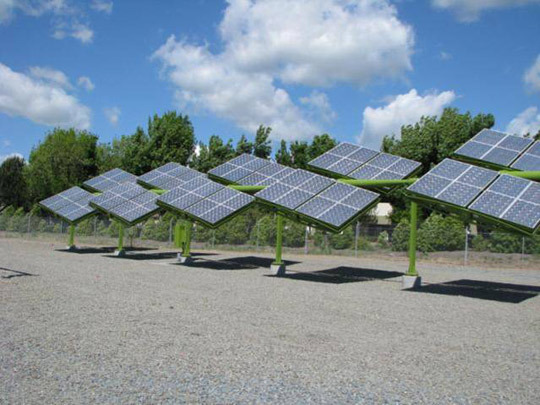 Spire Solar is also an aspiring supplier of these triple-junction cells. Recently, JDSU, the optical networking, laser and coatings expert, announced that they were entering the CPV market as a chip supplier. 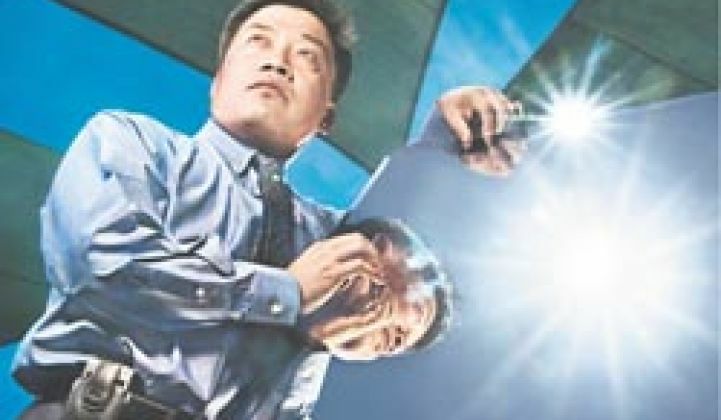 The concentrated photovoltaic (CPV) market has been long on promise and short on results. But there have been a few hopeful signs of late. Kleiner Perkins saw fit to invest $130 million into CPV systems vendor Amonix. And shortly after that fund raise, Cogentrix announced a 30-megawatt project with Amonix. That's easily the largest CPV project in the sector's history. SolFocus recently said that it would have 10 megawatts in the ground by the end of the year and just announced a 16.8-kilowatt CPV installation at the Border Environment Cooperation Commission (BECC) offices in the United States-Mexico border city of Juarez, Mexico. Concentrix Solar, German-based CPV vendor, funded by Good Energies and recently purchased by Soitec, just announced the opening of a U.S. office and a CEC listing. Greenvolts picked up $7.5 million in VC funding in what looks like a restart. Here's a photo of the new Greenvolts design, which we are told looks a lot like the old Emcore design, except painted green. Last year, Ed Gunther made what he thought was an "out-there" prediction, suggesting that the Emcore board of directors and executive management would be ousted when when an activist shareholder gains majority control to effect regime change. Suddenly, that scenario doesn't seem that farfetched. And as long as we're making wild speculations -- how about a firm like Amonix, Concentrix or JDSU acquiring the semiconductor assets of the ailing Emcore?